Classic Pvc Home Improvements, Choose your double glazing company carefully, you're choosing for life! Welcome to Classic PVC, committed to providing superior quality products and terrific services, combined with excellent value for money. Whether you require doors, windows, porches, canopies or a conservatory, we can provide the right product for you. A conservatory is your space for doing as you please. Choose wisely and it will go on pleasing you for many years to come. Strength and Durability are provided by the use of Aluminium sections which gives structurally sound windows and doors for your peace of mind. There is a variety of doors made popular by modern materials, from stylish double doors to a huge variety of conventional residential doors. Our GRP Composite doors offer the look and feel of a timber door without the inherent problems. No need for painting, sanding or varnishing. The only difficulty with looking for new uPVC double glazing windows is the fantastic range of windows you have to choose from. Offering a traditional design, with new technology to provide extra comfort and practical features for modern living. Make the entrance to your home just as attractive as the rest of the windows and doors with one of our porches. As well as giving your home a touch of class, a canopy can also protect the entrance to your home from all the weather elements. 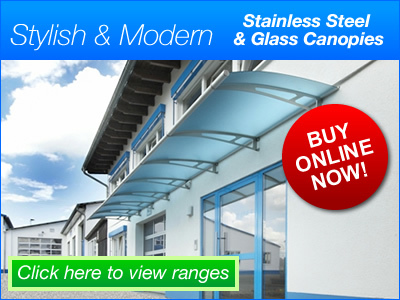 These stainless steel and Galvanised canopies have been designed to bring a touch of individuality and style to your home, office, shop, warehouse or factory. The timber around your roofline may not win much of your attention but it can be a real headache when it starts to deteriorate. A variety of different styles of glass are available to suit your home, from clear glass through to beveled or diamond cut. Want to see what your conservatory looks like before you buy? Or not sure what type of conservatory you would like. See Your Options, make the right choice and try our Free 3D Design Service. All you need is a photograph of your home and we will generate a selection of three dimensional conservatory designs, giving you options to choose the one best for you and your home. See anything you like? If you have any questions or have a general enquiry, contact us.